VB Migration Partner is a revolutionary software that has changed the way VB6 applications can be ported to VB.NET or C#. Much of the manual labor that is necessary with other migration tools can be avoided (or significantly reduced) if you adopt VB Migration Partner and take advantage of its pragmas and its innovative convert-test-fix methodology. 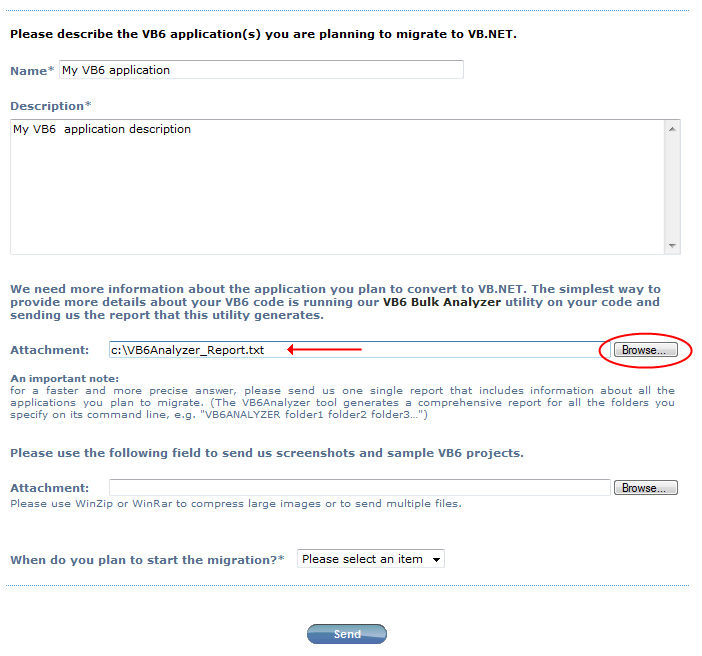 This document outlines all the steps you take when migrating a VB6 application using our tool. In spite of its highly optimistic title, not all these steps are equally easy. On the other hand, not all of them are necessary in every project. 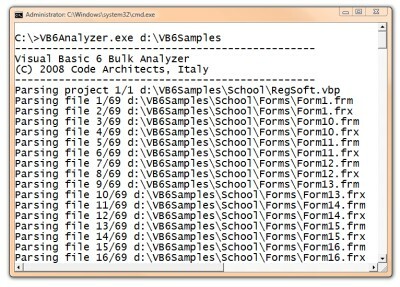 VB6 Bulk Analyzer can quickly analyze one or more directory trees, therefore it is quite capable to handle all the projects that are part of your application. It generates a simple textual report, that contains the most important information about your projects, including code metrics, the list of type libraries and ActiveX controls it uses, and – above all – the VB6 features that might require some extra efforts during the migration. VB6 Bulk Analyzer is similar to Microsoft VB6 Upgrade Assessment Tool, except it is tailored for migrations based on Code Architects VB Migration Partner rather than the less powerful Upgrade Wizard that comes with Visual Studio. It is essential that you specify all source code folders on the command line, to create a consolidated report. The report is named VBAnalyzer_Report.txt and is created in the current directory. The contents of the VBAnalyzer_Report.txt should be enough self-explanatory, but you don’t need to interpret it yourself. Instead, go to our Contact Us page, fill a few fields with your name and email, select “Question (technical)” from the Reason combobox, and use the special Attachment field to upload the report file. We typically analyze the report as soon as we receive it, of course if our office is open when you send it. (Please account for time zone difference… we live at G.M.T. +1.) We typically reply in a few hours, even though complex reports might take longer. In return for your report you will receive a very detailed textual assessment of your VB6 application, with tips on how to leverage VB Migration Partner for a smooth migration experience. If a given issue has multiple solutions, the assessment document explains the pros and cons of each option. For example, the assessment often includes recommendations on the best way to migrate your ActiveX controls and your database-intensive code, among the other things. 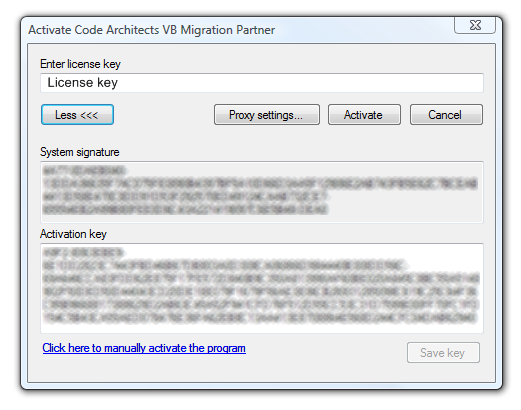 The mail from Code Architects usually contains also information about the VB Migration Partner license that is most appropriate for your needs. For more information about our license terms, read the FAQ section and download the End User License Agreement (EULA). Notice that users of the Trial Edition enjoy the same degree of support that regular users do. Providing tech support is an expensive activity and this explains why the Trial Edition expires in a week and its validity can’t be extended. This is surely the simplest step in the entire process. Regardless of whether you purchased the commercial edition of VB Migration Partner or are just testing the Trial Edition, you will receive a download URL. Follow the link, download the file, unzip it, and run the setup procedure. 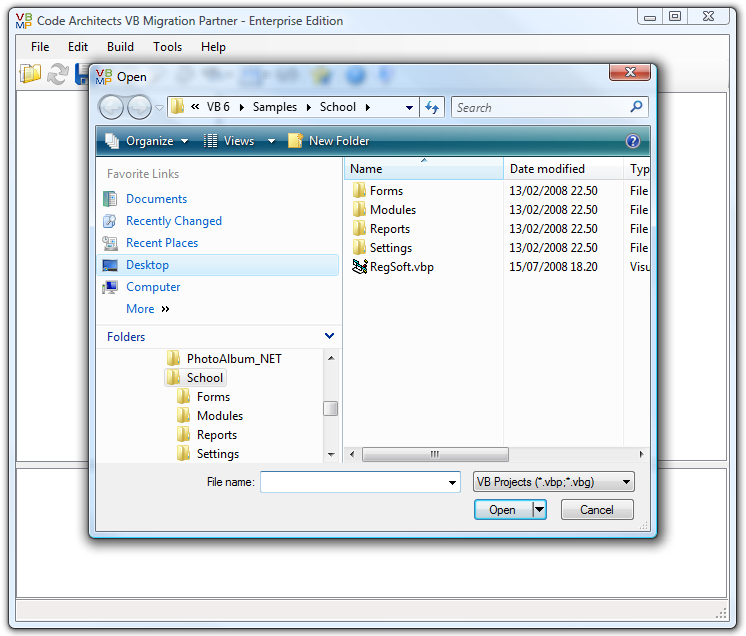 The first time you run VB Migration Partner you’ll have to register your copy. This procedure is fully automated and runs as soon as you attempt your first migration. In some rare cases – for example, if your firewall is very picky about which packets can run over the network – the automated procedure fails and you’ll have to perform a manual registration. Each time you launch it, VB Migration Partner checks whether a new version is available and asks you whether you want to download it. We recommend that you always run the most recent build that is available on our servers. Before using VB Migration Partner you should have a quick read at its manual, with a keen eye on the section related to migration pragmas. If you master pragmas you can make VB Migration Partner do whatever you want, therefore the time you devote to studying them won’t be wasted. Also, we recommend that you give at least a quick look at our knowledge base. Don’t read each and every article, just a quick read of their titles should be enough to ring a bell in your brain if and when you bump into a migration issue that we know how to solve. The reasons why you might need to edit the VB6 code before attempting the migration are pointed out in the assessment document you receive from the VB Migration Partner team. Two of the most common VB6 features that require some care in this stage are outlined below. VB Migration Partner supports all VB6 features related to Declare statements – for example, As Any and callback parameters are virtually always translated correctly. However, some calls to Windows API or other external DLLs might use the undocumented VarPtr, StrPtr, and ObjPtr methods. These VB6 methods aren’t supported under VB.NET/C# and there is no automated way to migrate them. The report that VB6 Bulk Analyzer generates highlights whether your application uses these keywords. If it does, you should use the Find command in the VB6 IDE to locate each one of them and see whether you can remove individual occurrences. In many cases you can prepare your Declare-intensive VB6 code for migration by wrapping all calls inside methods. For a detailed discussion of this technique, please read the whitepaper “Tips for smooth migration of Windows API calls”. The .NET Framework doesn’t support anything that can be considered as equivalent to ActiveX EXEs. VB Migration Partner allows you to choose whether the project should be converted into a standard EXE project or a .NET DLL, therefore you must decide what is most appropriate in each specific case. There can be several reasons why a VB6 project had to be compiled as an ActiveX EXE. One of the most common was that you needed a stand-alone executable that could also expose objects to the outside, for example an order processing application that exposes an object model for other apps (or plug-ins) to access and manipulate the data using a simplified and consistent interface. In such cases, you can solve elegantly your migration problems by splitting the ActiveX EXE project in two parts: an ActiveX DLL project that exposes the object model and a standard EXE project that shows the user interface and references the DLL. It’s now time for the first run through VB Migration Partner. If you have a project group (a .vbg file) that gathers all the VB6 projects of your app, load it in VB Migration Partner. If you have separate .vbp projects, consider whether you should create a .vbg file for the only purpose of migrating them in one single operation. In general, migrating multiple projects in one step delivers better results, because VB Migration Partner can generate better code for inter-project calls. VB Migration performs this test because it guarantees that the VB6 source code is syntactically correct and has compiled without errors. If you are sure that all post-compilation changes are OK and haven’t introduced any syntax error, just press OK and continue. If you don’t want to be bothered by this message in the future, you can disable the test by selecting the “Omit warning if VB6 executable is missing or outdated” option in the General tab of the Tools-Options dialog box. 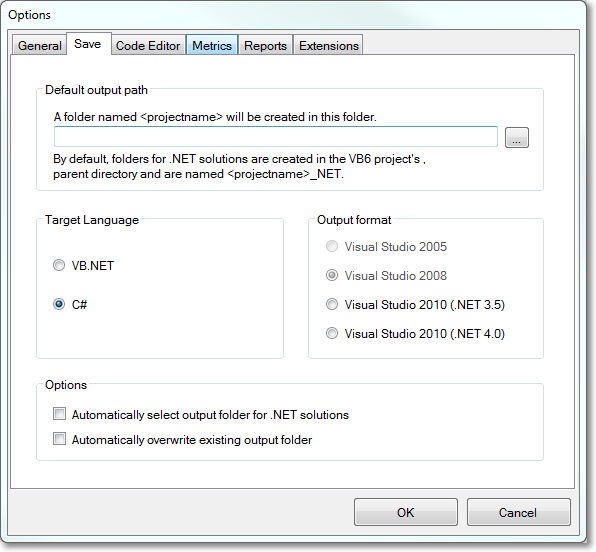 Once the project is successfully loaded, you should select the target language (VB.NET or C#) and the target version of Visual Studio and .NET Framework, in the Save tab of the Tools-Options dialog box. 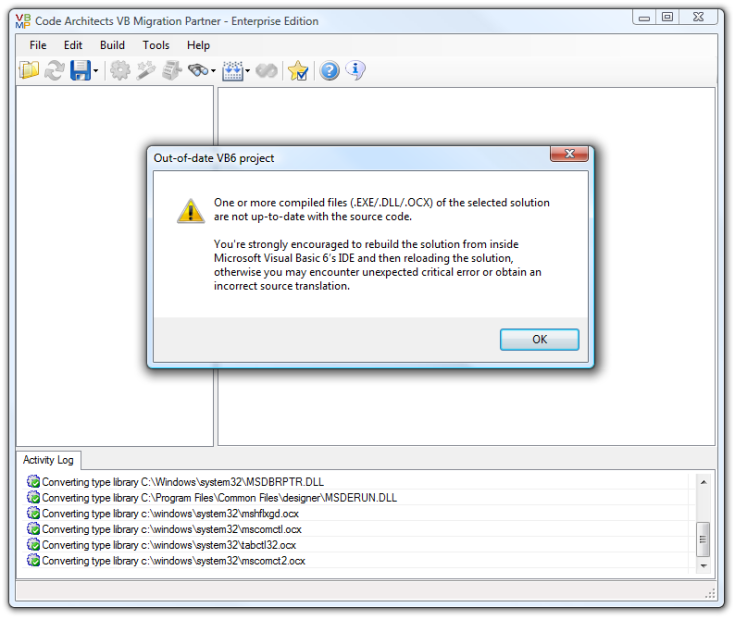 Activity Log – VB Migration Partner emits several messages in this window during the migration process. You should check these messages to ensure that all went well, that all type libraries and ActiveX controls were found, that no unrecognized syntax forms where found, etc. If an error message is found in this window, odds are that you tried to convert a VB6 project that can’t compile, you didn’t installed all COM type libraries correctly, or you run VB Migration Partner on a computer different from the computer where you compiled the VB6 project. Migration Results – This window displays all migration warnings and errors. The presence of a warning or error doesn’t necessarily indicate that the conversion has failed; it only means that you have to pay close attention to the specified portions of the VB.NET ot C# code and ensure that they converted correctly. You can also get a summary of all migration results – with all issues and warnings in a given project or file – grouped by their type – by clicking on the Warnings tab in the right pane. If you are very lucky, this window will display no error messages and the VB.NET or C# code is ready to compile and run. It doesn’t happen often, though, but it happens. If there are many compilation errors, don’t feel discouraged. Most of these errors are likely to have the same cause. They will go away after adding a few well-chosen pragmas. Also, notice that the Visual Basic 2005 and 2008 compilers have a limit of 102 error messages, after which the compilation is aborted, therefore you will never see more than 102 errors. This means that you still see 102 errors even after fixing some of them, because you then see errors that weren’t visible before. 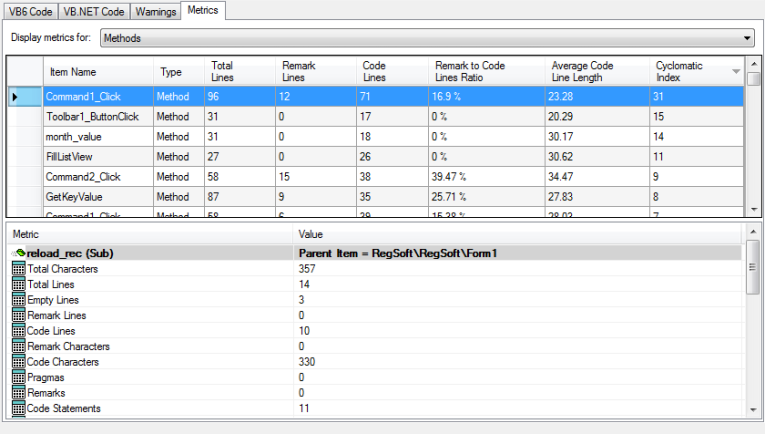 Code Metrics – the Metrics tab in the right pane displays stats about the project or file selected in the tree view on the left. This information can be useful for a number of purposes. For example, you may sort projects and files on their size, so that you can start with the simplest project or you can assign each project to a different people in your team. One of the most important values in the table is the Cyclomatic index, which measures all the possible execution paths inside a method. For example, a method that contains only an If block has a CI equal to 2; if the Else block contains a Select Case block with five Case sections, then the method’s CI is equal to 6, and so forth. The CI is important in migration scenarios because it represents the approximate number of tests you should perform to ensure that the .NET code behaves exactly like the original VB6 code. By sorting all methods in a file on their CI you can quickly see which methods are more complex and should be give more attention during the test and QA phase. The Metrics tab also show how many “problematic” VB6 items are in a given project or file, including Variant variables, Gosub keywords, On Error statements, auto-instancing (As New) variables, arrays with non-zero lower bounds, and so forth. High values for these counters are indicators that you might need to pay more attention to the corresponding classes and methods. 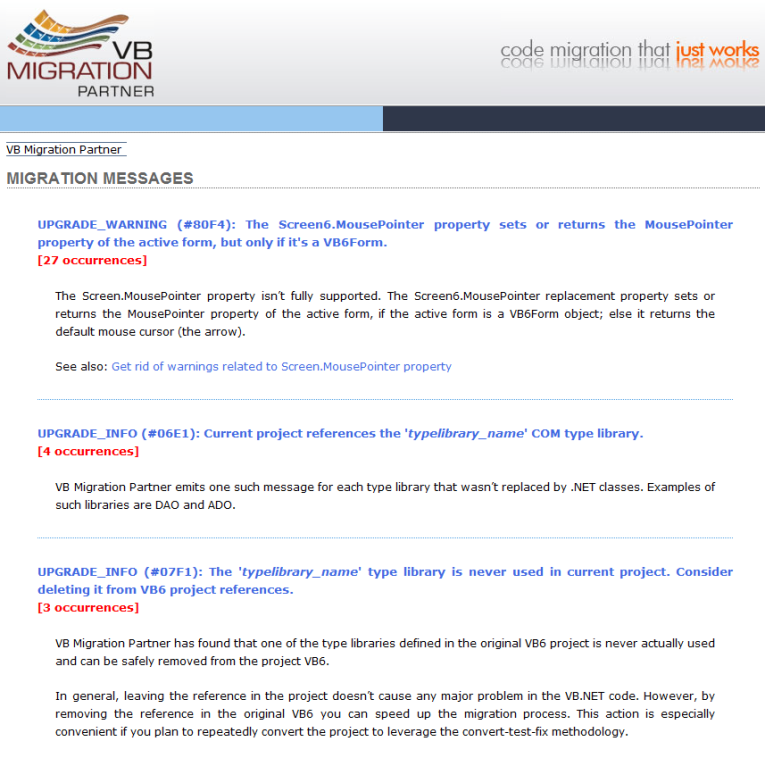 Migration message explanation – If you are new to migrations from VB6, odds are that many migration errors and warnings will look a bit obscure. Or maybe you understand what a message means and still have no cue on how to fix it. In such cases, you can use the Explain Errors and Warnings command in the Tools menu to produce a detailed explanation of each migration message and a description of available workarounds. Notice that this report is created on Code Architects’ Web server, therefore it requires a working Internet connection. Only the ID and the number of occurrences of each warning are sent to our server; no information about your application ever leaves your computer. 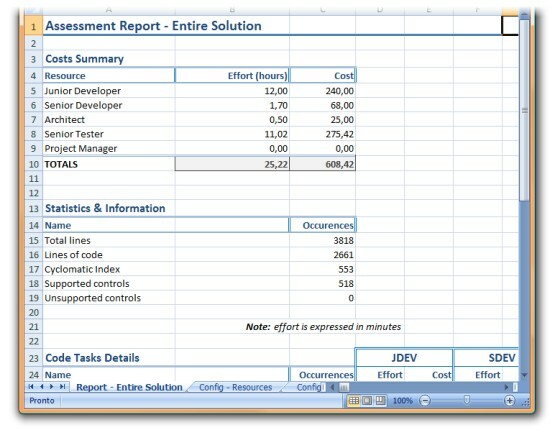 Assessment report - You can generate a Microsoft Excel worksheet containing a very detailed report of all the migration errors and warnings, together with an estimation of the time required to fix them, get a fully working .NET application, and complete the migration process. The report also contains an estimation of costs, which are evaluated by multiplying the time required for the hourly wage of the people in your team. The report accounts for five professional roles: junior and senior developer, test, architect, and product manager. All values in the spreadsheet can be customized and you can even provide a custom template if you wish, in the Reports tab of the Tools-Options dialog box. Before you produce your first assessment report, a word of caution is in order. All time/cost estimations are based on the assumption that each warning/error must be fixed singularly. This assumption always brings to very high numbers, and therefore to a very expensive migration. For example, if the original VB6 code contains many Variant variables, odds are that the VB.NET code will contains hundreds of warnings #0354 (“Unable to read default member of symbol 'XYZ'. Consider using the GetDefaultMember6 helper method.”). According to the standard Excel template, it takes 1 minute from a junior developer and 1 minute for a tester to fix this warning, which means that even a simple VB6 project might require many hours just to get rid of this warning. The bottom line is, be aware that cost/time evaluations you read in assessment reports are often over-estimated and should be taken with a grain of salt. This step is necessary only if your project uses one or more ActiveX controls that aren’t in VB6 toolbox. Run the AxWrapperGen utility to generate the code for the wrapper class. 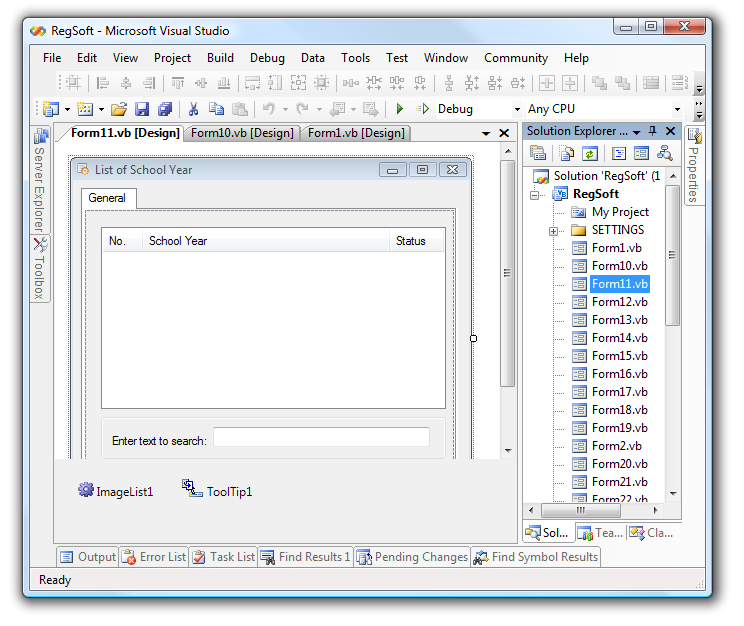 The utility generates a single .NET class library project that contains one wrapper class for each control contained in an .ocx file. Load the generated .NET project in Visual Studio, read the instructions at the top of each wrapper class, and edit the code accordingly. Compile the project and deploy the resulting DLL in VB Migration Partner’s install folder. Editing the wrapper class is necessary only for complex ActiveX controls, such as grids. In most other cases, the code that AxWrapperGen generates compiles correctly at the first attempt. Notice that these operations are optional, in the sense that you might prefer to immediately skip to next step, without having prepared any ActiveX control wrapper. In this case you’ll end up with one or more red rectangles on your VB.NET forms, each one working as a placeholder for an unrecognized ActiveX control. The decision of not converting ActiveX controls with AxWrapperGen can be convenient in some cases, for example if the ActiveX control is used only a few times in the entire project and you plan to replace it with a native .NET control anyway when the migration is completed. In this step you get rid of all the compilation errors in your VB.NET or C# code, so that you can finally launch it. If VB Migration Partner were a “traditional” conversion tool – like the Upgrade Wizard or any other conversion software on the market – you’d need to fix each and every compilation error in the VB.NET code. In other words, you wouldn’t run the conversion tool any longer and just work on a “snapshot” of the converted code. Fortunately for you, VB Migration Partner is not a traditional conversion tool. Rather, it’s a sophisticated piece of software that accompanies you during all the phases in your migration initiative, from the initial planning to the test stage. The key of VB Migration Partner’s power is the so-called convert-test-fix methodology. In a nutshell, the convert-test-fix methodology boils down to the following, simple statement: never, ever manually modify the converted .NET. Instead, you apply one or more pragmas to the original VB6 code and re-run the migration. The great thing about pragmas is that you can apply them to the solution-, project-, file-, method- and variable-level. Quite often a few project-level pragmas can eliminate all compilation errors – or at least the large majority of them. type the pragma in the VB6 editor, save the file, then switch to VB Migration Partner, reload the project (using the Reload command in the File menu), and re-run the migration. 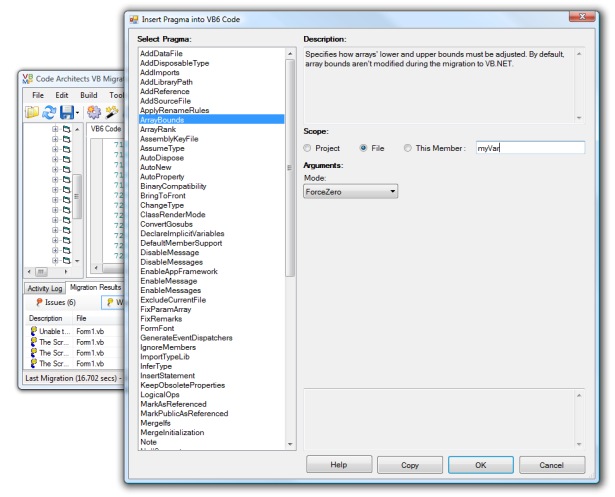 use VB Migration Partner’s integrated code editor to insert the pragma in the original VB6 code, save, and re-run the migration. (for project-level pragmas only) use Notepad or another text editor to enter the pragma in a *.pragmas file in the same folder as the .vbp file, then reload the project using the Reload command in the File menu, and re-run the migration. You can use the Insert Pragma command (in Edit menu) to have VB Migration Partner help you in selecting the right pragma for a specific purpose. In scenario A, use the Copy button and then paste the code right in the VB6 editor. 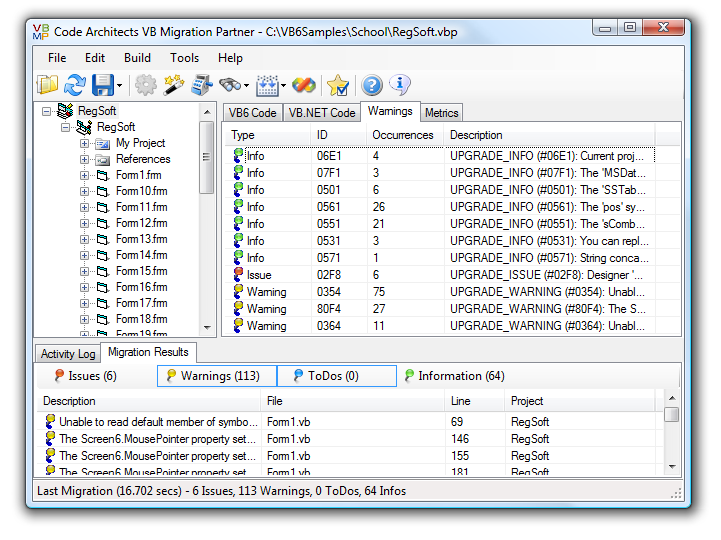 In scenario B, click on the OK button to insert the code in VB Migration Partner’s integrated editor. ImportTypeLib is useful if VB Migration Partner fails to correctly recognize a type library. SetName allows you to assign a different name to a variable or member, in case the original VB6 name clashes with a VB.NET, C# or .NET Framework member. ArrayBounds and ShiftIndexes can fix problems with arrays having nonzero lower index. ArrayRank can be necessary if VB Migration Partner hasn’t enough information to infer the number of dimensions of an array. MergeInitialization can be necessary if VB Migration Partner fails to correctly merge a variable with the first assignment to it. ClassRenderMode should be used if you are migrating a public classed used as an interface, but VB Migration Partner can’t generate the correct interface because the current ActiveX DLL project doesn’t include an Implements statement that references the interface. UseDynamic generates dynamic variables that support late-bound calls, rather than cumbersome calls to the VB6Helpers.Invoke method. CSharpOption OverloadsForByval generates method overloads that contain by-value parameters instead of ref parameters, which in turn reduces the need to generate temporary variables when invoking thos methods. CSharpOption ExplicitInterfaceImplementation can help you implement an interface without name collisions. CSharpOption ConvertOnErrorResumeNext generates lambda methods for each statement under the scope of an On Error Resume Next statement. CSharpOption UseOut attempts to use out parameters instead of ref parameters, which in turn can simplify the code that invokes the method. DeclareImplicitVariables is useful for modules that lack an Option Explicit statement. ConvertGosubs attempts to convert Gosubs into calls to separated methods. MergeIfs refactors nested IFs into a single IF that uses the AndAlso operator. Once again, the compile-test-fix methodology is an iterative process: you add one or more pragmas, convert to VB.NET and then compile the project (or load it into Visual Studio) to have a look at all compilation errors. #0501: Member isn’t used anywhere in current application. #0511: Member is referenced only by members that haven’t found to be used in current application. These messages typically mark portions of VB.NET or C# code that will be never executed and that should be dropped during the migration process. In general you’ll take care of this code during the optimization step, but if the code contains one or more portions that are never used yet contain many compilation errors, it might make sense to drop those portions now. Instead of deleting the code in the original VB6 code, you can use the RemoveUnusedMembers and RemoveUnreachableCode pragmas with the Remarks argument, so that the code will be temporarily commented until you come to a final decision about whether you should really delete it. If the .NET code has no compilation errors, you can run it inside Visual Studio and check that it behaves as expected and that no unexpected errors occur at runtime. As for previous step, you should abide by the convert-test-fix methodology and refrain from manually editing the VB.NET or C# code. Instead, when you find an unexpected or unwanted runtime behavior you should insert or more pragmas in the original VB6 code and then run VB Migration Partner once again. DefaultMemberSupport allows to infer a variable’s default member at runtime and is useful with Object variables and with Variant variables that contain an object reference. InsertStatement, ReplaceStatement, ParseReplace, PreInclude and PostInclude insert or replace VB.NET code in the generated project. AutoNew ensures that an auto-instancing (As New) variable preserves its semantics in VB.NET. UseSystemString should be used with all Type…End Type structures that are passed to Declare methods. NullSupport should be used for Variant expressions that deal with Null values. AddDataFile copies one or more data files into the .NET project folder and avoids “File not found” errors. WrapDeclareWithCallbacks is used to prevent the “orphaned delegate” problem that may occur when calling a Declare method that takes a delegate object (the AddressOf keyword). CSharpOption AssumeConcatenation affects the way VB Migration Partner interprets the “+” symbol when used with Variant or Object variables. CSharpOption AssumeStringComparison affects the way VB Migration Partner interprets comparison operators when used with Variant or Object variables. Not all the runtime errors can be avoided or fixed by means of the above pragmas, though. The causes for unexpected errors can be just too many, but fortunately the VB Migration Partner’s support library automatically prevents most of these problems. All the known problems that the support library doesn’t handle automatically are documented in our Knowledge Base. A common problem that you solve in this step is Null values. 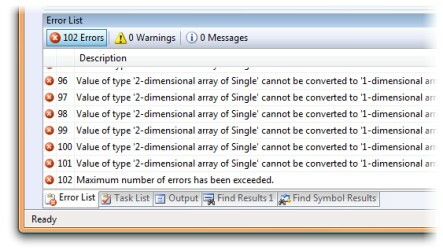 VB6 and VB.NET/C# greatly differ in how Null values are handled. In VB6 you can pass a Null value to most string functions, including Left, Mid, and Len (but not Left$ or Mid$), in which case the function returns Null. The .NET equivalent for Null is DBNull.Value, except you get an exception if you pass this value to any string function. Typically you solve this issue by a combination of the NullSupport and ReplaceStatement pragmas. After you successfully run the .NET project without any unexpected exception you can focus on refining the VB.NET code to achieve full functional equivalence with the original VB6 code. VB Migration Partner’s support library ensures that this step takes much less time than a traditional conversion tool. However, you might need to add a few pragmas to account for minor differences, especially those related to the user interface. For example, a common problem in the user interface is caused by .NET not supporting system fonts. VB Migration Partner must therefore convert them into similar (but not perfectly identical) true type fonts, which tend to occupy slightly more space. If a caption matches perfectly in a VB6 Label or Button control’s client area, odds are that a portion of the caption will be invisible after the migration to .NET. EnableAppFramework generates Windows XP-like user interface, specifies a splash screen, and more. FormFont, ReplaceFont, and ReplaceFontSize allow you to fix issues related to fonts, for example when a caption isn’t fully visible inside a Label or Button. WriteProperty permits to account for minor user-interface issues, for example to adjust the size or position of a control. BringToFront and SendToBack can be useful if a control is mistakenly hidden by other controls on the converted VB.NET form. FixParamArray should be used with methods that modify the elements of a ParamArray argument, to preserve the by-reference semantics. UseByVal is often necessary to prevent exceptions when exiting a method that has received read-only properties. AddDisposableType and AutoDispose help you to ensure that objects are released correctly and avoid exception when accessing a resource such as a file or a database connection. ThreadSafe is necessary when migrating a DLL that can be used in multi-threaded scenarios, for example by ASP.NET clients. It almost goes without saying that you can be sure that you have fully achieved complete functional equivalence only after stressing the VB.NET application with an exhaustive QA test, which usually takes a lot of time and energies. For this reason, you might want to postpone the QA test to the last step. However, the ultimate goal of any migration process is to improve the application, for example by making it faster or more scalable. This is the kind of things you accomplish in this last step. #0531: You can replace call to unmanaged method with a .NET member. #0561: A symbol was defined without an explicit “As” clause. #0571: String concatenation inside a loop. Consider declaring the variable as a StringBuilder6 object. #05B1: The variable wasn’t explicitly declared. #07F1: Type library is never used in current project. Consider deleting it from VB6 project references. RemoveUnusedMembers and RemoveUnreachableCode delete portions of VB.NET code that aren’t actually used. InferType and SetType allow you to generate a specific type for Object and Variant variables. ApplyRenameRules generates code that is compliant with .NET Framework naming guidelines. BinaryCompatibility ensures that the generated .NET DLL is compatible with existing COM clients (VB.NET only). AssemblyKeyFile generates assemblies that are signed with a strong name. AutoProperty converts a field into a property, for better data encapsulation. UseTryCatch attempts to replace On Error statements with Try... Catch blocks (VB.NET only). AddImports allows you to simplify long namespaces in code. UseNetMethods attempts to replace calls to support library with calls to native .NET methods (C# only). Arguably, the most effective optimization technique has to do with string concatenation (see warning 0571). This article explains how you can take advantage of the StringBuilder6 class to speed up string operations by two or three orders of magnitude. If you are migrating an N-tier application that is split in many DLLs, you might also want to improve the startup time by the VB6Config.ParsingAssembliesAtStartup property to False. For more info, read this article. discard any reference to COM type libraries and replace them with references to .NET DLLs. modify the wrapper classes generated in step 5, so that the class inherits from a native .NET control rather than the original ActiveX control. revise your ADO, DAO, or RDO code and use ADO.NET instead. attempt to replace calls to Declare statements with native .NET objects and methods. Strictly speaking, at this point the migration from VB6 has been completed and you can start selling it or deploy it at your existing customers’ site. In practice, however, you often wish to add new features to the application before releasing it to your customers. A converted application can be extended with new classes exactly like a VB.NET or C# project built from scratch inside Visual Studio. You can add new controls to existing (migrated) forms or add new forms that weren’t included in the original VB6 project. The one thing you cannot do is dropping controls from the VB Migration Partner library onto a plain .NET form. 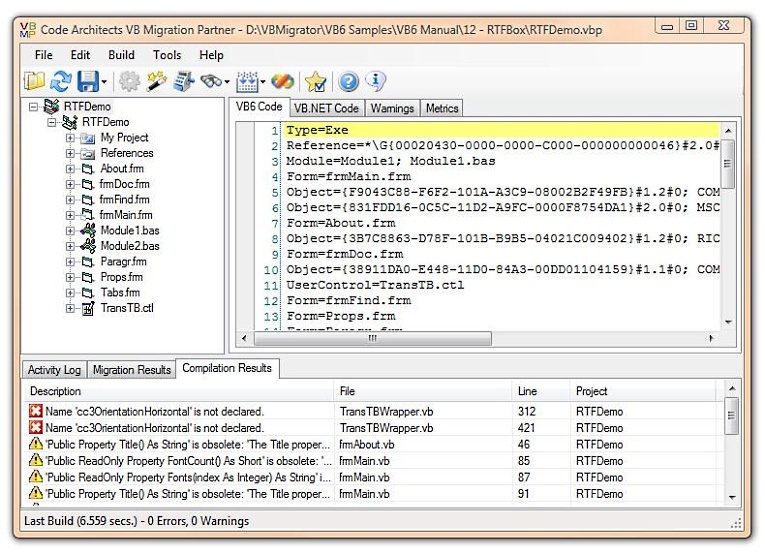 All the controls in VB Migration Partner’s library – with few exceptions – inherit from a native .NET control. 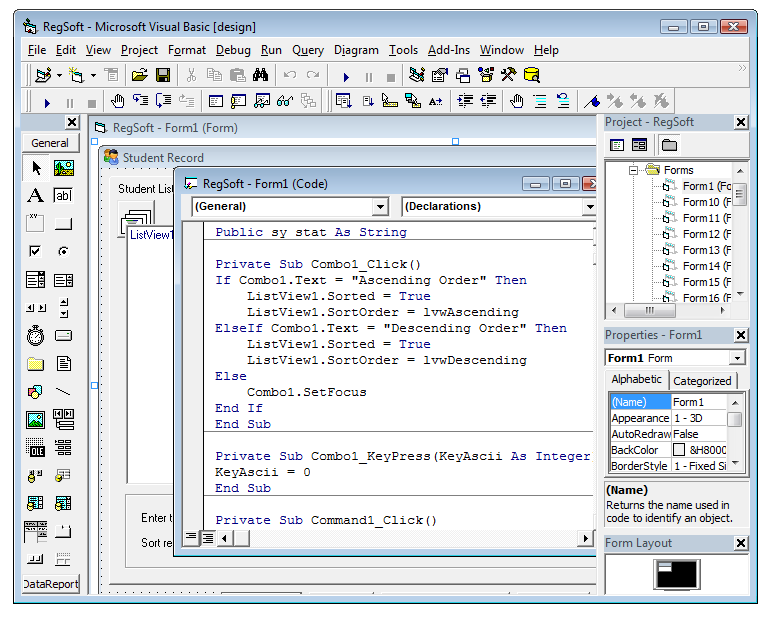 For example, the VB6TextBox control inherits from the System.Windows.Forms.TextBox control. This article shows how you can leverage the extra features offered by the .NET controls, thanks to inheritance and the special NetObject property. For example, the VB6ComboBox control exposes several properties and methods that are missing in the VB6 ComboBox – including the DropDownWidth, DropDownHeight, and FormatString properties - because it inherits them from the .NET ComboBox. You can assign these properties in the code-behind portion of the form by using a WriteProperty pragma, or at runtime using an InsertStatement pragma. Of course, you can also just manually edit the .NET form and code, however we recommend that you continue to use pragmas and the convert-test-fix methodology as long as possible, or at least until you are absolutely certain that you can throw the VB6 source away and focus exclusively on the .NET version of your application. This document explains how you can convert a VB6 application of average complexity into VB.NET or C# using VB Migration Partner in ten relatively easy steps. Obviously, not all the steps described here equally easy. Likewise, each migration project is a story of its own, therefore it’s quite difficult to predict how long each step will take. In simpler projects you might be able to skip a few steps entirely, for example manual editing of the VB6 code (step 4) or the optimization phase (step 10). In all case, the most effective route towards a successful migration begins when you send us an email with the report from the VB6 Bulk Analyzer. From that point on, we can give you a hand.